The Fed’s current zero interest rate policy (ZIRP) has been in place since 2008. However, the change in wording does not mean rates will start moving higher immediately. Nor do they indicate rates will quickly reach the Fed’s long-run target of 2%. In fact, the Fed’s statement indicates it is maintaining its patient stance. The Fed’s reluctance to raise rates too quickly is likely the result of concerns about the financial stresses caused by the sharp decline in oil prices and the strength of the U.S. dollar. This view is likely supported by the uptick in junk bond yields and the corresponding selloffs in the stocks, bonds and currencies of emerging economies. This uncertainty is likely behind the Fed’s patient approach. As can be seen from the table, the track record for stocks looks okay. 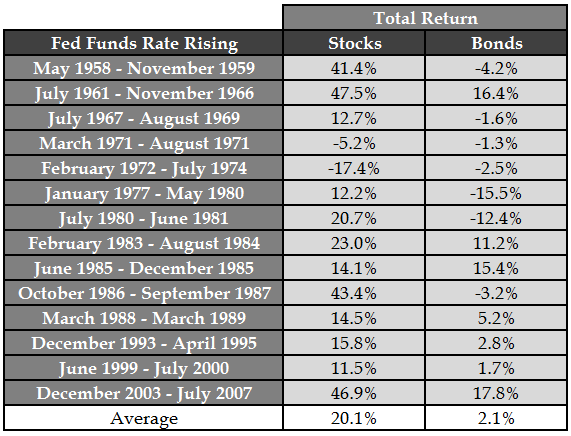 It reflects only two down periods during the 14 largest rate increases and the worst one included one of history’s worst bear markets (1973-1974). These figures represent total returns; but on an annualized basis, the S&P 500 delivered gains that were about in line with the market’s long-term average of approximately 10% per year. Against this backdrop, we maintain our positive, long-term market view and remain diligent to our approach of finding well-managed, attractively valued equities that we believe have the potential to deliver attractive long-term gains. Please note that we will not publish our Weekly Economic Update on Monday, December 29. We would like to wish all of you Happy Holidays. Our next commentary will be published on Monday, January 5.